Currently being used on nearly 140,000 e-stores worldwide, Prestashop has emerged as one of the biggest and most reliable e-commerce platforms on the Internet. Many of the Prestashop templates rely on a minimalist design so that product placement & display are paramount, and it allows for simple integration. We are going to show you 20 of the best Prestashop templates that can be used for electronic-focused websites and are ready to use right away. A fully responsive theme with an electronics focus. 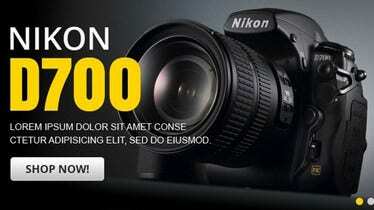 It is made with Prestashop in mind and has bright neon colors to give it a contemporary feel. Specially designed to highlight products and has a useful grid display under the main image slider. Great for displaying information about a sale. The grid under the image slider uses red to highlight savings and important details. A hover effect over featured products and the clean look make it perfect of an electronics e-store. A Prestashop template that makes good use of white space. The theme allows products to be showcases in an easy to see format with several being displayed on the main image slider. Fully responsive design as well. A trendy and modern monochrome layout with full Prestashop support. Easily highlights and displays certain products and is suited most to a mobile phone store. Has a separate “featured products” section and a four-column design. Large and interactive banners that activate with the cursor, Powerful Electronics Store is a great Prestashop template to use for an online technology shop. Clean layout and can easily display featured products with a handy navigation bar at the top. Responsive design. A professional design that is quite minimalist in its approach. It features a prominent main menu with a big image slider for products and smaller grid-like display underneath for more detail. Makes good use of black and white for a simple yet effective design. A Prestashop template that is specifically designed to be used for a mobile phone e-commerce site. Clean and modern layout and has the ability to showcase main products in the large image slider. Is also very easy to navigate and get around the site. 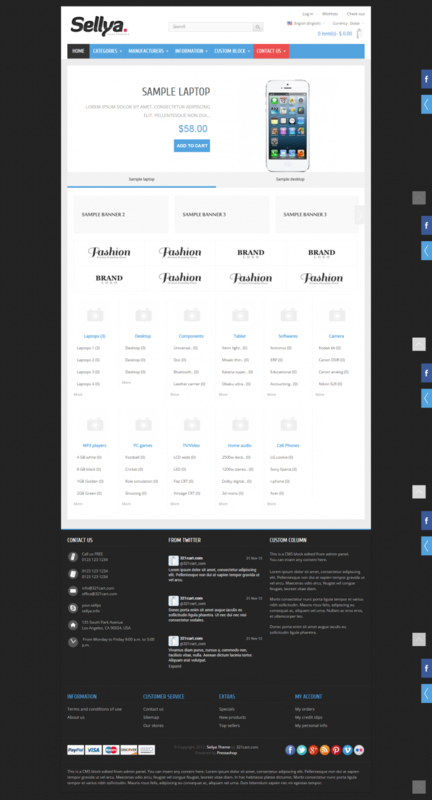 A Prestashop e-commerce design. Dilecta is fully responsive and features a slide-show to display certain products. Great when used with an electronics website due to the clean nature of the layout and has a cloud zoom to increase image size. A darker theme with a hint of purple that is perfect to be used with Prestashop and a mobile phone e-store. Accessible navigation, large image slider and grid display for other products makes this one a good electronics template with a pleasing color scheme. Fully responsive and clean Prestashop template. Allows for all manner of electronics items to be displayed in an easy, accessible fashion and the template itself makes good use of white space to create a clean & modern look. A clean electronics store Prestashop template. Uses a green effect on the navigation bar and is also used to highlight certain pieces of information in a modern design. Can display numerous items on the main page and benefits from an easy navigational system. 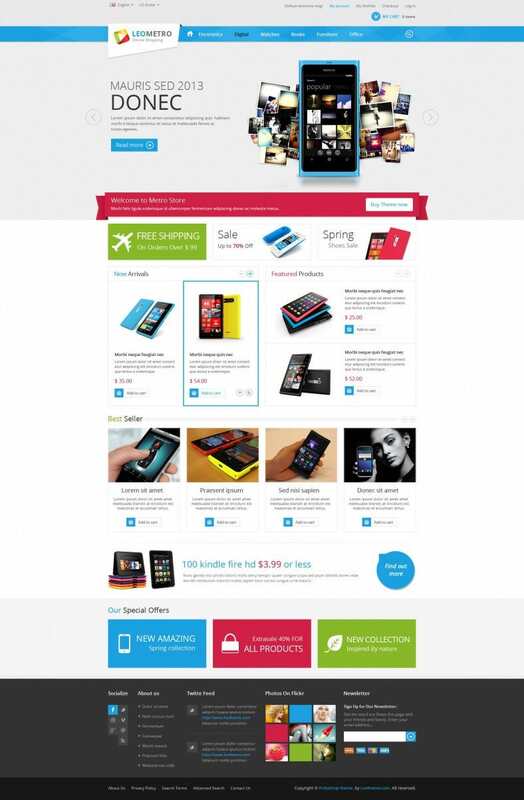 Fully responsive theme with Prestashop. Is optimized for speed which is a bonus with an image heavy electronics store and has full compatibility with major browsers. Its clean and professional design make it a great business orientated template. Minimalist layout and style with Prestashop integration. Has a drop down menu effect to further keep everything simple and clean. Large image slider to showcase certain products and is also fully responsive for mobiles and tablet displays. A professional digital store with Prestashop integration. This template has the feel of a real store and is highly functional with a large product slider as its main focus and a “feature product” grid displays underneath. Can fit a lot of information on the main page without becoming messy. A dark Prestashop template that combines black and grays to create a positive looking theme. Designed to be used with mobile phones, it allows featured models to be displayed and has a clean look that, with its color scheme, is slightly different than many electronics templates. A perfect theme for an electronics store. With full Prestashop functionality, the theme has a clean and modern layout with two main sliders to push featured products. Also has a drop down menu to save on space.